"Being more smart in 45min is a final goal of this session :-)"
"This session will cover MySQL/InnoDB configuration tuning. Which setting for which workload? Which value will be better for my system? How to avoid potential bottlenecks from the beginning? Do I need a purge thread? I was told InnoDB doesn't need thread concurrency anymore? Is my IO capacity setting good enough?.. - these an many other questions are often asked by MySQL DBA and developers.. Things are changing quickly and constantly, and there is no "silver bullet" :-) But understanding of the configuration settings impact is already a huge step in performance improvement :-) Bring your ideas too, share them with others - discussion is open, it's only driven by a speaker :-) Latest benchmark results will be presented as well.. Being more smart in 45min is a final goal of this session :-)"
Let's see more in details now.. But what about InnoDB thread concurrency?.. Ok, but even if this lock contention is inevitable, may it be at least reduced or limited?.. Also - my CPU cores are having 2 hardware threads, so it's hard to say that one core is equal to one simple core, in case of MySQL bi-thread core may work as well as two cores!.. - and helping to reduce the lock contention as only one hardware thread from two may be executed by its core on the same time..
Query-2: main contention on the "buffer pool mutex" and "kernel_mutex"
Query-3: main contention on the "kernel_mutex"
To save place here, I'm putting the results from all 6 tested configurations on the same graph. 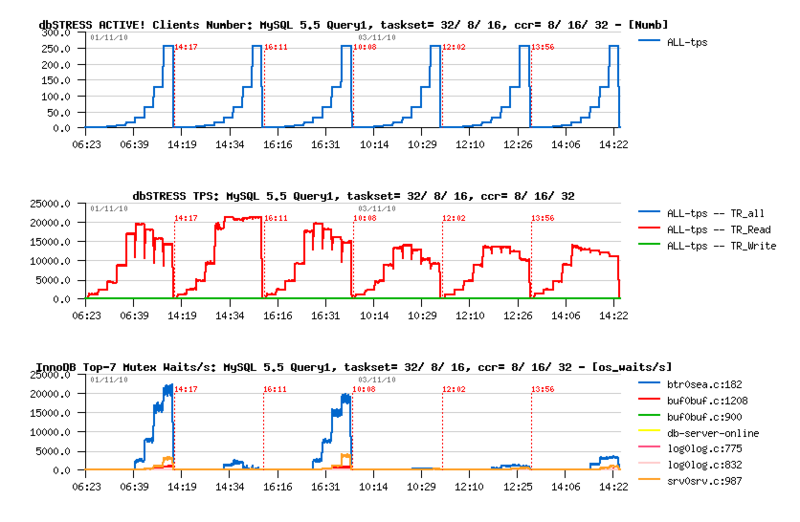 Each configuration was tested one after each other, so you may observe 6 workloads over a time scale per graph. The first graph representing the number of active sessions (users). The second one - reached TPS level. 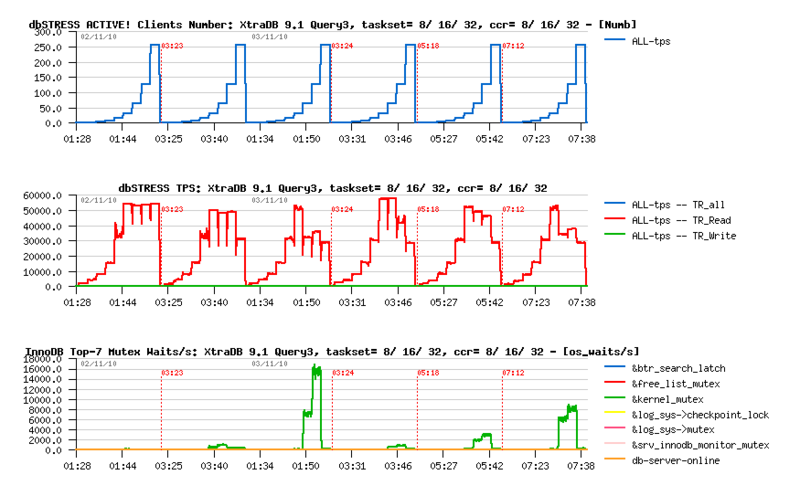 And the third one - Top-10 Mutex Waits reported by InnoDB. Let's get a look on the results now.. Workload scalability on this SQL query is mainly limited by contention on the "btr_search_latch" mutex. Using non-zero innodb_thread_concurrency giving a lower results even on 256 concurrent users comparing to default innodb_thread_concurrency=0 setting.. 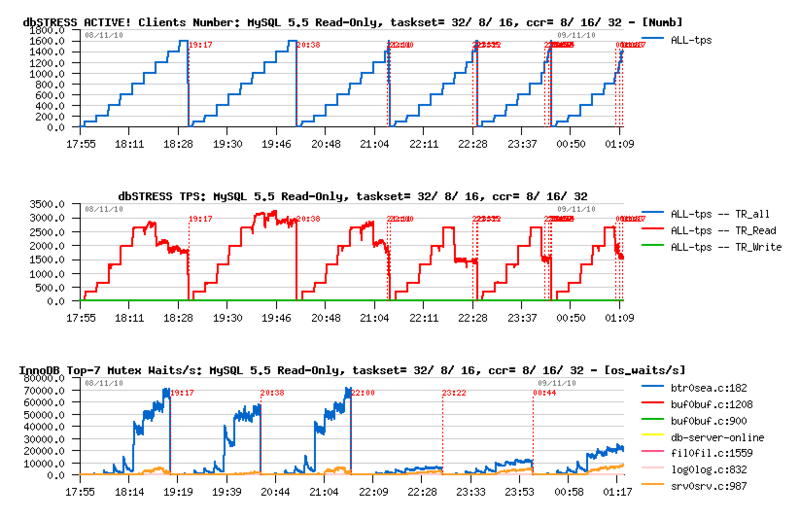 Interesting that in last 3 configurations the mutex waits are reduced dramatically! - however the waits on the concurrency mutex are not reported by InnoDB and I suppose these waits are the main stopper here, so we don't see an improvement similar to seen on 8 cores task set.. This query is limited by the "buffer pool mutex" and "the kernel_mutex" contentions. Similar to Query-1, the highest and the most stable performance level is obtained on the 8 cores task set configuration..
Again, limiting lock contention via "innodb_thread_concurrency" makes things worse.. This query is manly limited by contention on the "kernel_mutex". 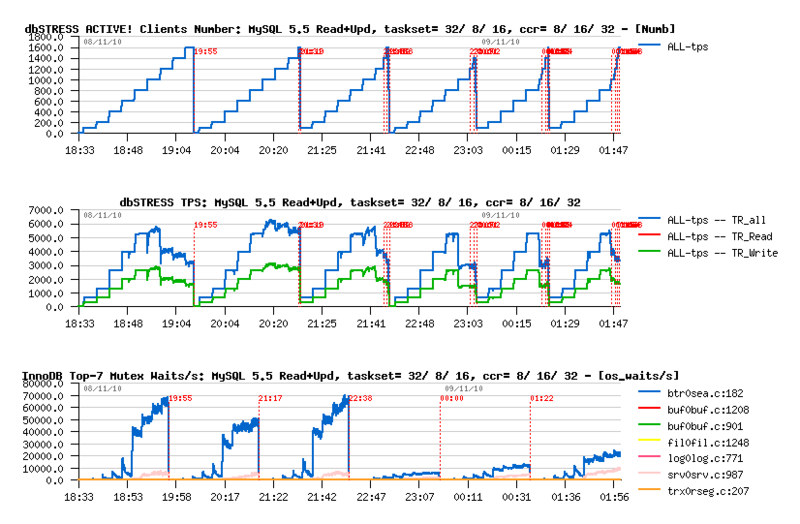 Performance on the 8 cores task set is the best once again.. 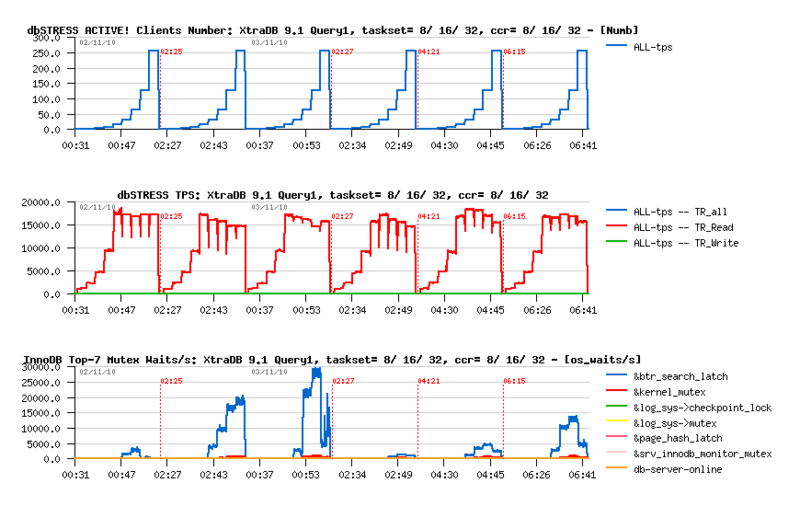 However, on 32 cores having innodb_thread_concurrency=16 looks better than zero! - seems contention on the "kernel_mutex" has a different impact/pattern for this query.. I was curious to replay the same workloads also on XtraDB 9.1 - but NOT in goal to compare it with MySQL 5.5 (otherwise I have to use the latest XtraDB version, and it's not the case) - my interest here is to see the impact of the "innodb_thread_concurrency" setting but when the "timer-based" concurrency model is enabled! - this model was introduced within MySQL 5.4, ported by Percona team into XtraDB, but was finally not included within MySQL 5.5. 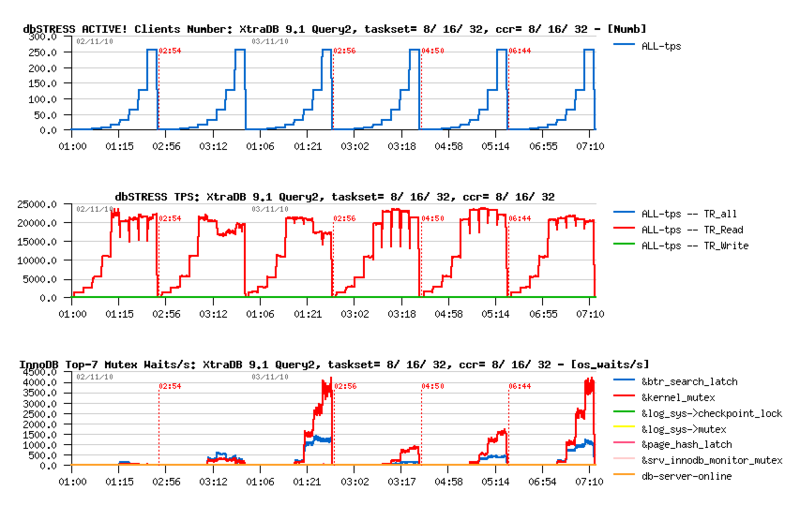 However on its time this model was near free of locks, and as XtraDB 9.1 was comparable in performance with MySQL 5.5.4, I was curious to know if we did not miss anything within the latest releases of MySQL 5.5.. NOTE : during the following tests on XtraDB the task-set configurations were tested in a different order - 8, 16, 32 cores vs previously 32, 8, 16 cores.. - so just keep in mind when looking on the graphs ;-) (sorry for that, but it was too late to fix it).. 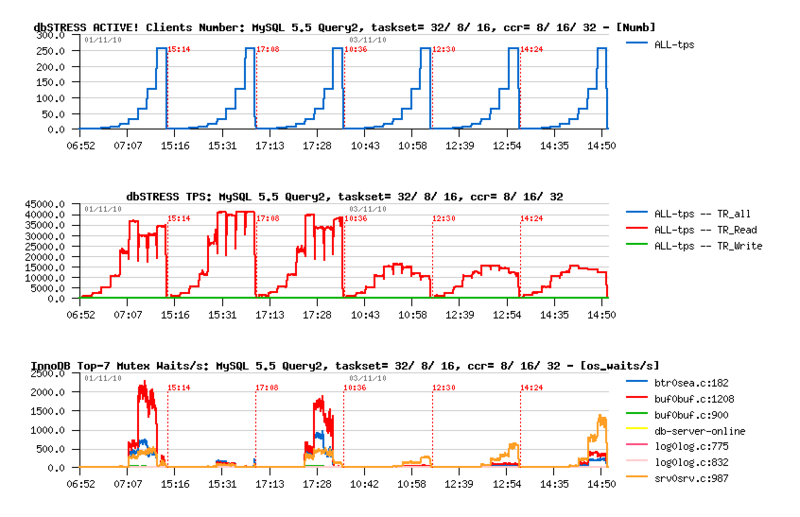 However, using a Timer-Based concurrency model is not too bad, and even showing the max TPS level! Wow! - Timer-Based model is a true winer here! 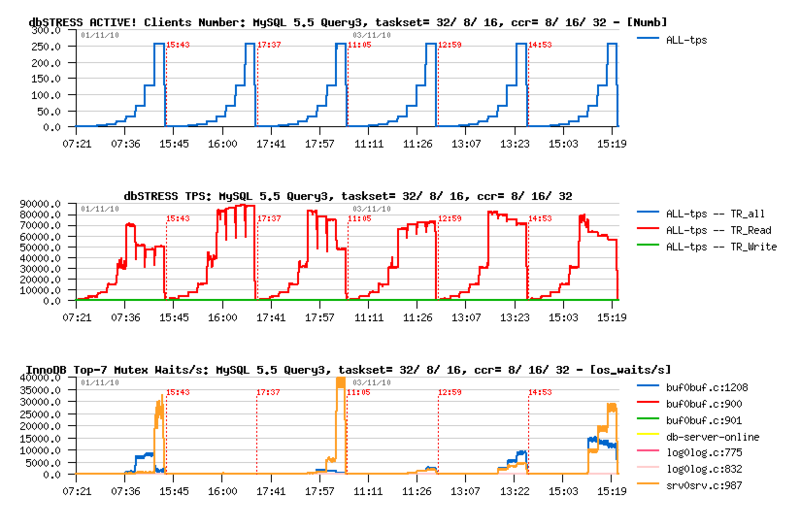 Interesting that Query-2 is running x2 times faster vs Query-1 on MySQL 5.5, but not on XtraDB 9.1 don't know why.. - any ideas?.. Curiously, on this query NOT only 8 cores task-set is keeping workload stable and without degradation..
As well, the max TPS level is reached with a Timer-based model here.. So far, until now from the previous tests globally the most better results are obtained within an 8 cores task-set configuration. But what will happen if I have more than 256 concurrent user sessions?.. - in the past this test was impossible to run successfully having "innodb_thread_concurrency=0" whatever a number of CPU you have.. Well, of course, a system having 1600 concurrent users is usually has not the same workload profile as a non-stop 1-256 users tested before.. The main difference here will be with a presence of a "think time", which means that each user will do a pause between transactions (simulation of user actions, ex. reading a web page, etc.). All details about these 2 years old results you may find in this report . As you can see, setting "inodb_thread_concurrency=8" solved the situation and guaranteed a stability within an execution order! - so each user was able to run on the one transaction/sec speed. Curiously reaching 1600 users sessions on the Linux box was not without surprises..
Another problem seems to be related to the Linux kernel and I was unable to fix it on time: since a high number of running processes the network communications started to have timeouts, and some statistics data were missed time to time (you may recognize this periods by vertical red point lines on the following graphs)..
Hmm.. - once again the 8 cores task-set showing the best performance here.. However since 1000 users (in best case) not every user was able to execute its 3 transactions/sec, but TPS remains stable around 3000..
On the last test I wanted to see the impact of the presence of the Write transactions mixed to Reads.. - only Update statements are used within a Write transaction here and the ratio between Read/writes is 50/50 here..
Also interesting that the level of the mutex waits did not change with the presence of Updates - still the same contention on the "btr_search_latch" and "kernel_mutex"..
Once again, the 8 cores task-set shows the most better result.. Seems to me since MySQL 5.5.6 the "innofb_thread_concurrency" setting should be used now very carefully! - as I was able to see several cases when it makes things worse, then you'll be able too ;-) - seriously, just keep in mind that it may reduce your performance, so always check what's going on.. - what is fine at least that this variable is dynamic and can be changed back at any time, so it's easy to check if it helps you or not even on the live workload.. Using CPU Affinity - looks very attractive! and I think there is definitely something to do! - this solution is absolutely free of application locks, so may only work :-) then of course it depends on how often do you spin on locks, etc. - but I think just having a solution to assign Master and Purge threads to dedicated CPU cores, and all "user" threads to other cores may help a lot in heavy workloads! As well it can be dynamic, etc..
Timer-based concurrency model - is still looking interesting and gives better results comparing to the original model. But as I wrote before, it cannot guarantee CPU cycles for every thread just because threads are waked up by timeout in a random order.. As well, it also as original model doesn't have a solution for a case when an active thread is involving an I/O operation and blocking on it for a while.. - during this time CPU cycles may be used by another thread from the wait queue, but it's not so..
"ERROR 1135 (HY000): Can't create a new thread (errno 11); if you are not out of available memory, you can consult the manual for a possible OS-dependent bug"
But the question is which resource if it's not a memory?.. The value 1024 drives me mad - because if it's really true, I should not be able to open more than 200-300 connections (as MySQL is using 4-5 file descriptors per connection in general), but I've already reached 800 connections until now!.. - And another killing thing is that my "max_connections" is set to 2000 and it's not changed by MySQL on start (usually if you're requesting a too high value it'll be adjusted by MySQL automatically on the start).. So what is wrong here?.. Then re-test again - the problem is still here since 1000 concurrent sessions..
What's next?.. - once you've asking all around, Google is your friend.. :-) - and I was surprised how often people are complaining by getting the same error!.. - some are even logged a bug on the MySQL site, but seems there was no solution for them as the problem was not reproduced.. Another lucky blog post was about a file descriptor limit: Can't create a new thread - but I've already check it, and MySQL is reporting as well "open_files_limit: 18010"..
every time the case less or more random -- you cannot say what is exactly the limit of the open sessions, sometime it's changing over a time..
most of cases was hard or impossible to reproduce, so it's clear the problem is coming from the particular user's configuration, just that user was unable to find which one..
in most cases users have not reached any limit in RAM, but in some cases there was a limit on open files.. I don't have all these limits, and my limit is appearing on the thread creation..
Well, it's strange to see a system limiting a number of processes per user by 1024, but from the other hand it'll be fine to add into MySQL code additional check according the "nproc" limit on the system and reduce the "max_connections" settings automatically if the limit is too low -- it's still better to spend a time understanding why your max sessions runtime value is lower than expected rather to see that 2000 for max sessions is accepted on the start up by MySQL, but then since some level you have connections reject for the reason you need yet to understand..